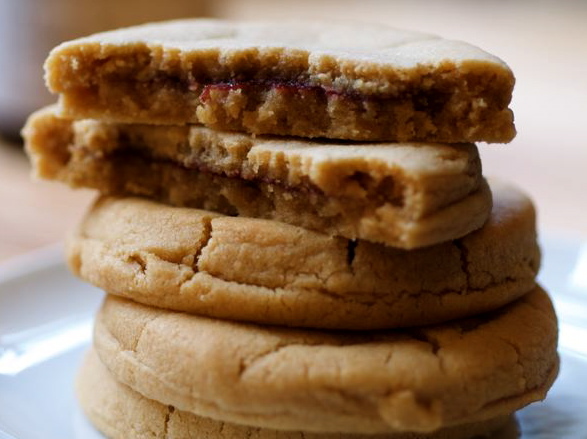 This is a cookie version of a peanut-butter-and-jelly sandwich. In the bowl of a stand mixer fitted with the paddle attachment, or in a large bowl with a hand mixer, cream together the butter, sugar, and brown sugar until smooth and fluffy, about 2 minutes. Scrape down the bowl. Beat in the peanut butter. Scrape down the bowl. Add the egg, and beat in. Beat in the vanilla. Scrape down the bowl. Gradually add the flour mixture. Wrap the dough in plastic wrap. Refrigerate for at least 4 hours. Dust an approximately 12-by-17-inch sheet of parchment paper with flour, place the dough on it, and dust the top of the dough. Top with another sheet of parchment and roll out to about ¼-inch thickness. Place with the parchment on a baking sheet and freeze for 30 minutes. Place racks in the middle and upper third of the oven, and preheat the oven to 350 degrees. Line two half sheet pans with parchment paper. Remove the top sheet of parchment from the dough, and using a 3-inch round cookie cutter, cut 3-inch circles of dough. Top 1 circle with 1 tsp. of the jelly and cover with another circle. Pinch the edges together and place on one of the baking sheets. Repeat with the remaining circles, placing the cookies 1 inch apart. Culinate editor's notes: You can, of course, use any kind of jam or jelly you like, not just grape jelly. For cutting out the cookie circles, you may want to use a smaller cookie cutter or juice glass that's about 1 1/2 inches in diameter. And for the leftover cookie dough, try turning it into simple thumbprint cookies: small circles of dough with thumbprint impressions in the centers, filled with small dabs of jam just before baking.